Don�t panic when faced with safties at the end of a rack. I am always amazed at the anxiousness and panic that overcome players when the end game in 9-ball or 10-ball involves safety play. All of a sudden, players don�t think clearly and don�t trust their technique. Perhaps it is because there are only two object balls left and it appears there is no place to hide. 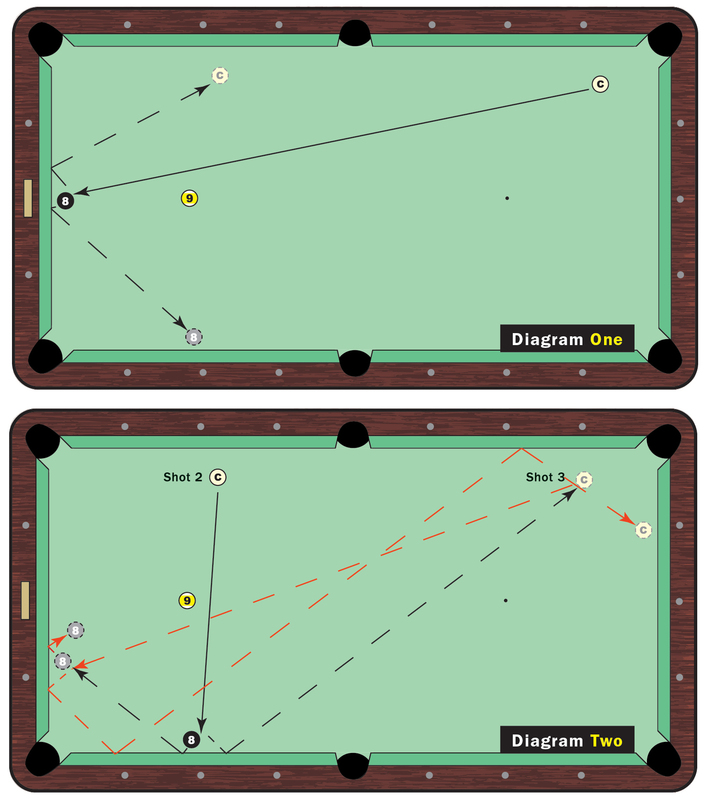 Still, end game safety play is an important part of 9-ball and 10-ball. If you can learn to trust your technique and judgment, and you can think clearly and stay calm, you will see big improvements in this area. End game safety play is all about percentages and, obviously, leaving your opponent in the toughest spot on the table. These situations pop up much more frequently than you might think, so if you mishit a safety or make the wrong decision, file it away in your memory bank for next time. I do an end game safety drill at home because it requires imagination, concentration and a good touch. To be honest, I really enjoy this part of the game. I love trying to force a mistake from my opponent and I love outwitting him. Some of the shots require just clipping the thin edges of the ball or kicking safe. That�s why speed control is so important. Knowing the proper speed is the key to re-safing your opponent. You have to at least make him earn the game. Diagrammed is the safety drill. I start with the first position and play safe (Diagram One). Then I play safe from that shot (Shot 1) and so on. These shots are based on percentages and cutting down angles for my opponent. Again, speed control and full focus are essential. You can even play this as a game against an opponent and see who can freeze the 8 to the bottom rail. You will notice that after the first shot, I avoid leaving the 8 ball on the bottom center diamond. That gives my opponent too many options and he�ll probably play side-rail to side-rail return, as I did in Shot 1. Leaving the ball closer to the first diamond, as in Shot 2 (Diagram Two), reaps better results because it cuts out so many options and leaves very difficult safeties for the opponent. Shot 3 is a shot that requires a razor-thin cut on the 8, so this shot will really test your ability to focus. Notice also that I avoid leaving the cue ball on the top middle diamond because that also cuts many of the angles and makes a return safety more difficult. Preventing your opponent from having an easy side-rail to side-rail shot is always a good thing. Make your opponent come with big shots. If you play the right shots in these situations, you will win at least 75 percent of the battles. It is all about imagination, confidence and trust.